Sales inspectors are hired in various industries such as – real estates, automobile stores, pest control, and so on, the basic duties of these inspectors are to inspect and survey the product/service from the point of sales. Though the job role may vary depending on the type of industry, the following are some of the common roles and responsibilities shouldered by the sales inspectors – responding to sales leads, making additional calls to provide after-sales support, performing quality inspections, addressing customer’s issues, presenting proposals for service or repair if needed, and submitting daily report to the management. 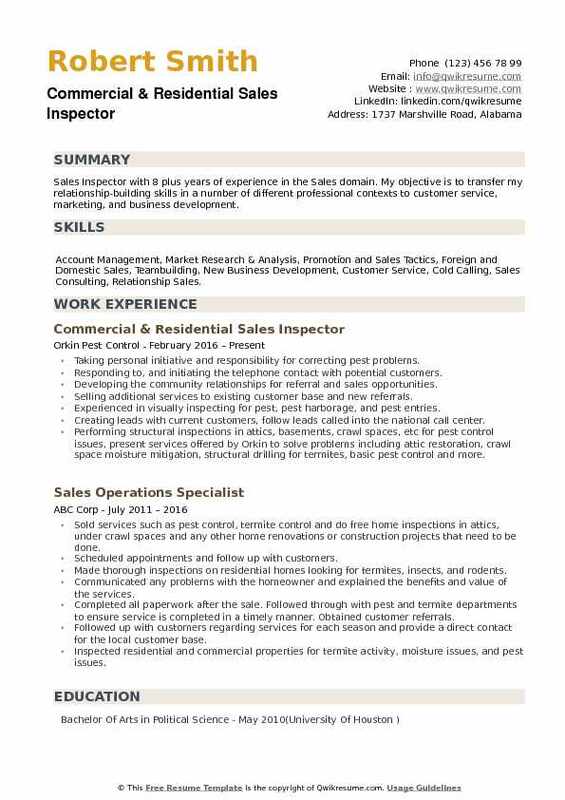 Headline : Dedicated Sales Inspector with 6 plus years of experience with outstanding social skills, tactfulness and best techniques to generate/maintain a positive company image. Objective - Experienced sales professional looking to bring dedication and hard work to a dynamic company Immediate value offered: Consistently exceeded Goals Ability to work under pressure and deadlines. MS Office proficient: Outlook, PowerPoint, Microsoft Word, and Excel. Generating nearly $35,000 in monthly sales revenue from warm and cold leads. Sold largest residential services deal in the company's 80-year history. Consistently ranked one of top 10 sales producers national, out of 400. Chosen to observe, analyze, and improve underperforming branches in other Florida districts. Advising the Senior Managers of underperforming branches on ways to improve sales processes and employee performance. Training other sales inspectors in all aspects of the sales process - identifying leads, qualifying leads, developing relationships, negotiating, closing deals, and pre-and post-sales support. Preparing the sales proposals and delivering oral presentations to C level decision makers, negotiate, and close deals. Managing 30-40 accounts monthly, developing proposals, closing deals, providing pre-sales and post-sales support. Working with proprietary sales and customer relationship management software. 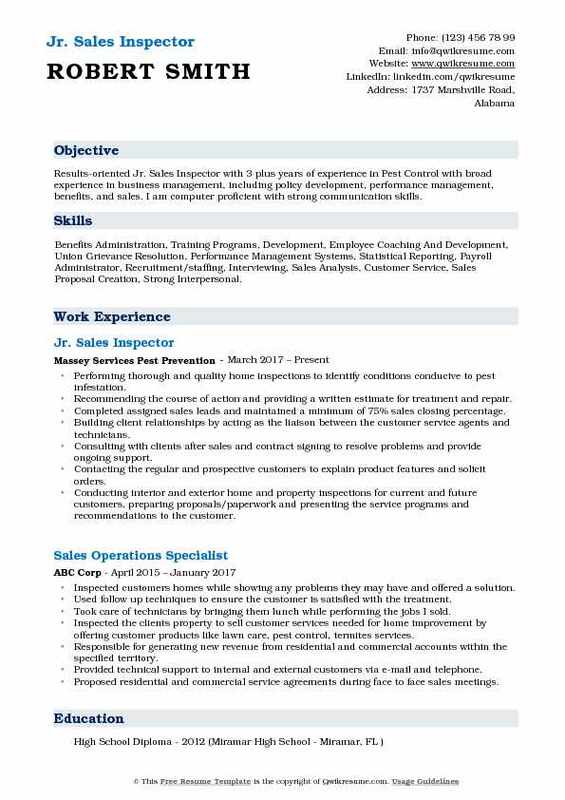 Objective : Junior Sales Inspector with 4 years of experience in Pest Control Services is seeking to find a position in an organization which will utilize my strong Customer Service skills, effective organizational skills and the proven ability to get the job done. Confirmed that appropriate changes were made to resolve customers problems. Tracked down sources of special products and services to meet customers special needs. Summary : Senior Sales Inspector with 8 years of experience is seeking a position that will benefit from my sales and customer service experience, and positive interaction skills that can be utilized to achieve the corporate goals. Provided high-quality pest elimination services to commercial job sites in a timely and professional manner. Professionally communicated the pest solutions to customers and solve their pest problems. Efficiently managed assigned route through scheduling, product and equipment inventory, collections, etc. Followed the pest elimination methods, procedures, and protocols, complying with the pest elimination procedures manual. Familiarized with and acted upon the provisions of the quality system appropriate to the responsibility of the position. Drove and maintained a company-provided service vehicle safely and professionally. Continuously trained in the company and national regulations maintaining required pesticide licensing. Adhered to company ohs policies, procedures and rules and follow safe work practices. Ensured full compliance with all applicable regulatory and corporate standards. 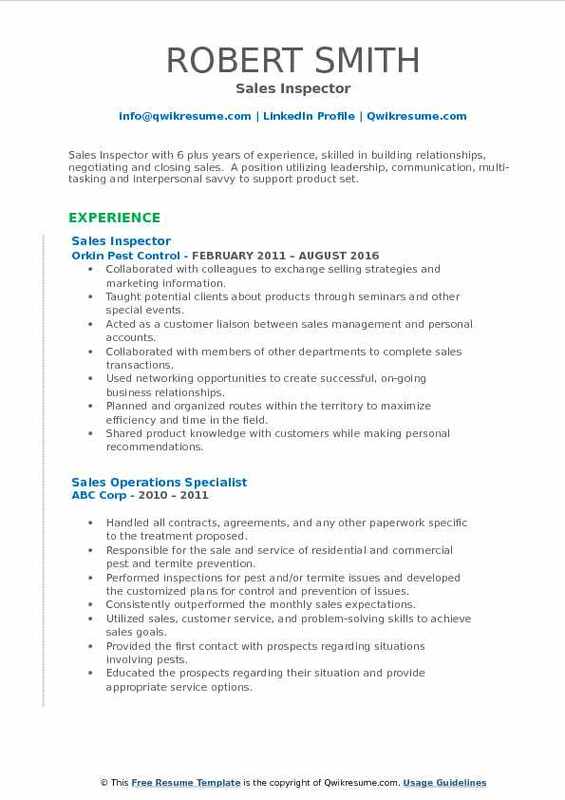 Headline : Sales Inspector with 6 plus years of experience, skilled in building relationships, negotiating and closing sales. A position utilizing leadership, communication, multi-tasking and interpersonal savvy to support product set. Skills : Inventory Control, Inventory Management, Management, Communications, Customer Service, Conflict Resolution, Training & Development, Operations Management, Inventory Management, Sales, Auditing. Acted as a customer liaison between sales management and personal accounts. Planned and organized routes within the territory to maximize efficiency and time in the field. Calculated the cost of services, prepared sales contracts, and inspection documentation. 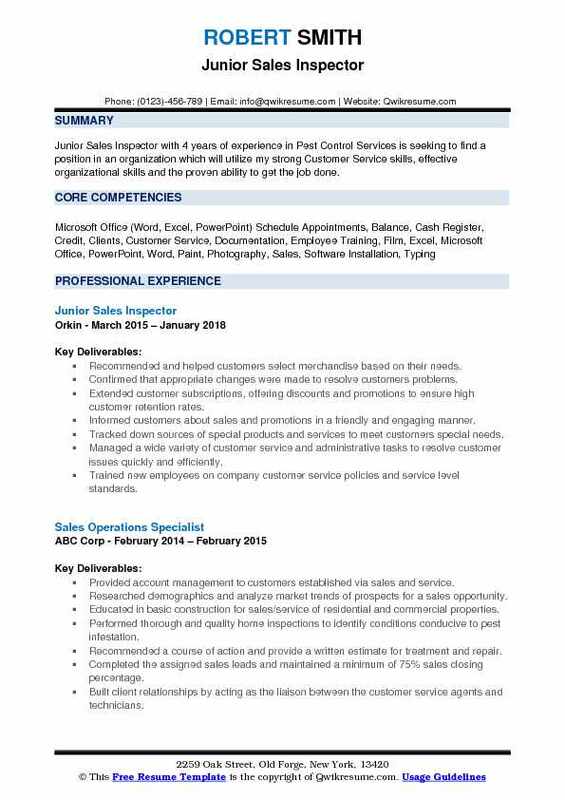 Headline : Sales Inspector with 5 years of experienceis seeking to further my professional career in a world-class company. Seeking to extend my skills in the claims industry as a part of a dynamic organization. 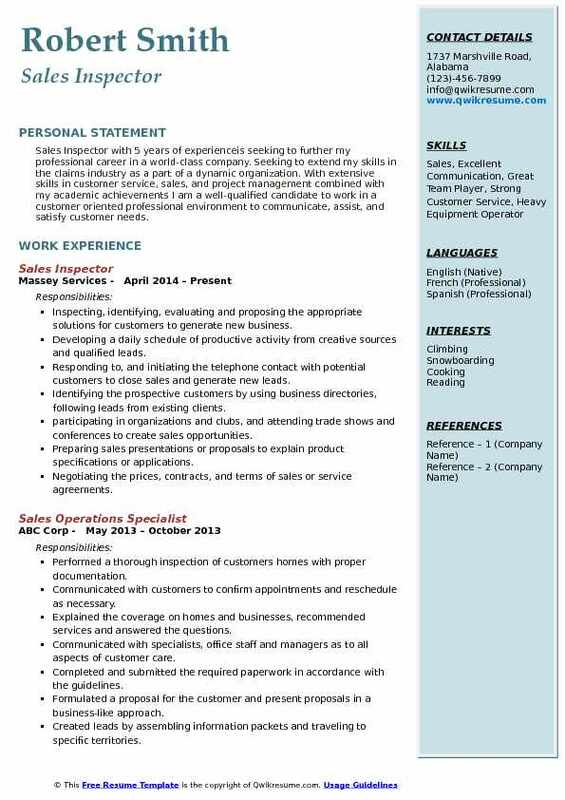 With extensive skills in customer service, sales, and project management combined with my academic achievements I am a well-qualified candidate to work in a customer oriented professional environment to communicate, assist, and satisfy customer needs. Inspecting, identifying, evaluating and proposing the appropriate solutions for customers to generate new business. Developing a daily schedule of productive activity from creative sources and qualified leads. Responding to, and initiating the telephone contact with potential customers to close sales and generate new leads. Identifying the prospective customers by using business directories, following leads from existing clients. participating in organizations and clubs, and attending trade shows and conferences to create sales opportunities. Preparing sales presentations or proposals to explain product specifications or applications. Negotiating the prices, contracts, and terms of sales or service agreements. Attending the sales and trade meetings, and reading the related publications in order to obtain information about market conditions, business trends, demographics and industry developments to maximize sales opportunities. Objective : Results-oriented Jr. Sales Inspector with 3 plus years of experience in Pest Control with broad experience in business management, including policy development, performance management, benefits, and sales. I am computer proficient with strong communication skills. 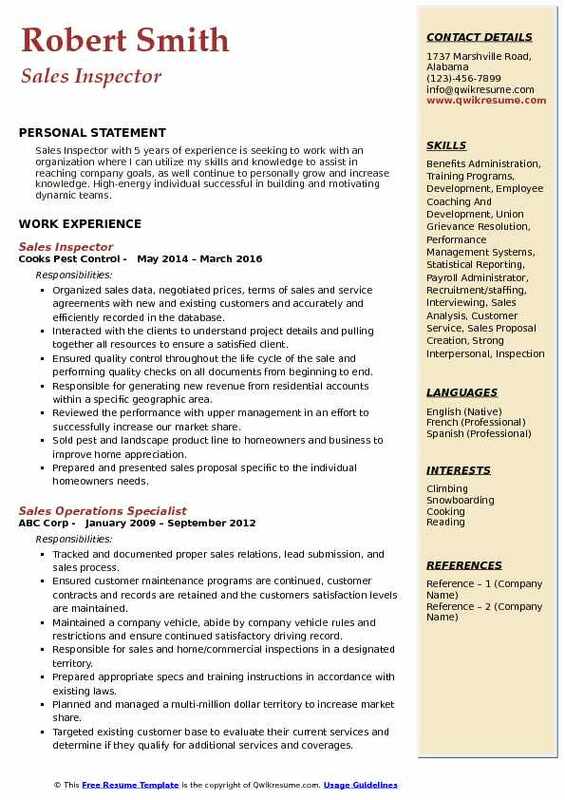 Skills : Benefits Administration, Training Programs, Development, Employee Coaching And Development, Union Grievance Resolution, Performance Management Systems, Statistical Reporting, Payroll Administrator, Recruitment/staffing, Interviewing, Sales Analysis, Customer Service, Sales Proposal Creation, Strong Interpersonal. Performing thorough and quality home inspections to identify conditions conducive to pest infestation. Recommending the course of action and providing a written estimate for treatment and repair. Completed assigned sales leads and maintained a minimum of 75% sales closing percentage. Building client relationships by acting as the liaison between the customer service agents and technicians. Consulting with clients after sales and contract signing to resolve problems and provide ongoing support. Contacting the regular and prospective customers to explain product features and solicit orders. Conducting interior and exterior home and property inspections for current and future customers, preparing proposals/paperwork and presenting the service programs and recommendations to the customer. Ensuring high post-sales satisfaction to facilitate positive, long-term relationships and high potential for repeat business with customers and increased referrals. Summary : Proven Sr. Sales Inspector with 8 plus years of experience in adding value to team-oriented organizations. A professional who provides seamless and transparent customer care to clients while performing at the highest level possible. 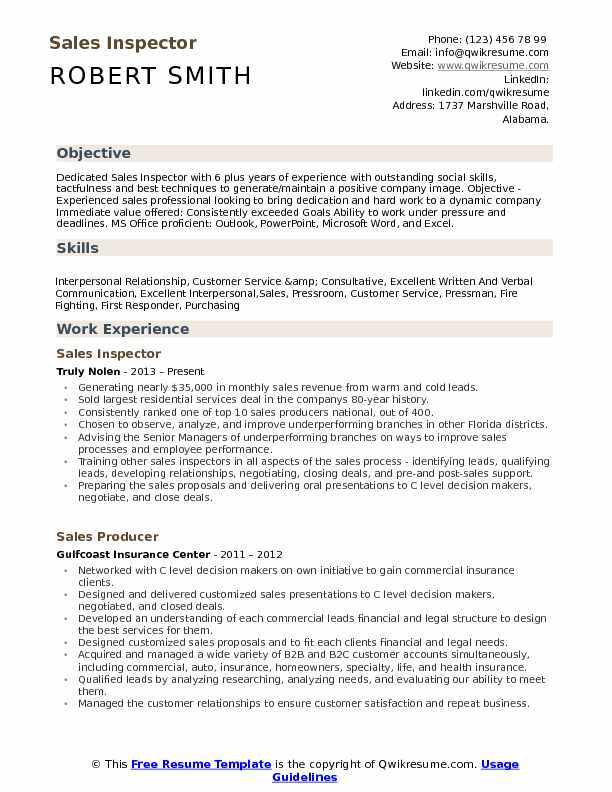 Proficient in Microsoft Office applications and Salesforce.com. Strong interpersonal skills in both independent and team focused environments. Skills : Extensive Management Experience, Managing People, Products, Equipment, and Money. Excellent Communication, Inventory Management, Both Classroom, and Field Training. Determining specific needs for individual homeowners and prepare proposals to recommend products and treatments to resolve existing issues and as preventative measures. Responsible for devising and executing sales plans from creative sources and qualified leads in a designated territory. Developing community relationships for referrals and new sales opportunities. Conducting home inspections and preparing a specific proposal for the individual homeowner's needs. Providing effective customer service and relations to increase sales and company profitability. Communicating solutions and services to solve customers pest control problems. Calling the prospective customers via referrals, self-generated leads and office lead. Achieved presidents club status, maintaining a sales average of $30,000 a month. Performing cold calling and follow up on referrals from various sources to generate sales. Developing a daily schedule of productive sales activity from creative sources and qualified leads. 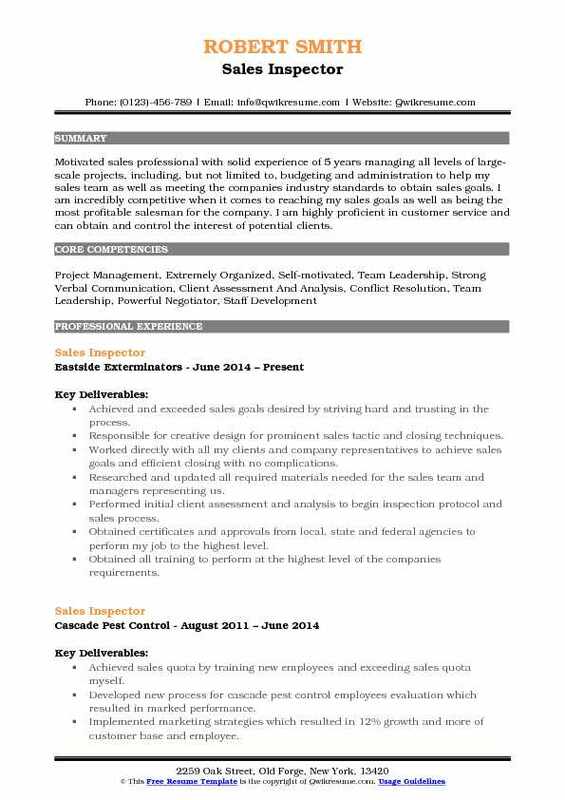 Headline : Motivated sales professional with solid experience of 5 years managing all levels of large-scale projects, including, but not limited to, budgeting and administration to help my sales team as well as meeting the companies industry standards to obtain sales goals. I am incredibly competitive when it comes to reaching my sales goals as well as being the most profitable salesman for the company. I am highly proficient in customer service and can obtain and control the interest of potential clients. Achieved and exceeded sales goals desired by striving hard and trusting in the process. Responsible for creative design for prominent sales tactic and closing techniques. Worked directly with all my clients and company representatives to achieve sales goals and efficient closing with no complications. Researched and updated all required materials needed for the sales team and managers representing us. Performed initial client assessment and analysis to begin inspection protocol and sales process. Obtained certificates and approvals from local, state and federal agencies to perform my job to the highest level. Obtained all training to perform at the highest level of the companies requirements. Strategically generated sales over leadership expectations and maintained relationships with current customers. Created relationships with vendors and referrals to generate sales. 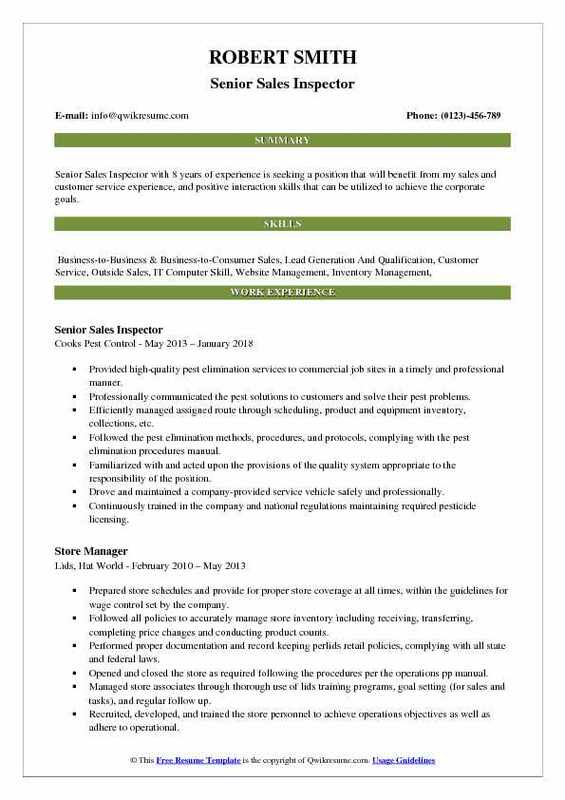 Headline : Sales Inspector with 5 years of experience is seeking to work with an organization where I can utilize my skills and knowledge to assist in reaching company goals, as well continue to personally grow and increase knowledge. High-energy individual successful in building and motivating dynamic teams. Organized sales data, negotiated prices, terms of sales and service agreements with new and existing customers and accurately and efficiently recorded in the database. Interacted with the clients to understand project details and pulling together all resources to ensure a satisfied client. Ensured quality control throughout the life cycle of the sale and performing quality checks on all documents from beginning to end. Responsible for generating new revenue from residential accounts within a specific geographic area. Reviewed the performance with upper management in an effort to successfully increase our market share. Sold pest and landscape product line to homeowners and business to improve home appreciation. Prepared and presented sales proposal specific to the individual homeowner's needs. Responsible for inspecting termites, pest harborage, and pest entries for homeowners and commercial. Met customers daily at their residence or business to perform inspections and sign them up for our services to control their pest needs while maintaining solid integrity. 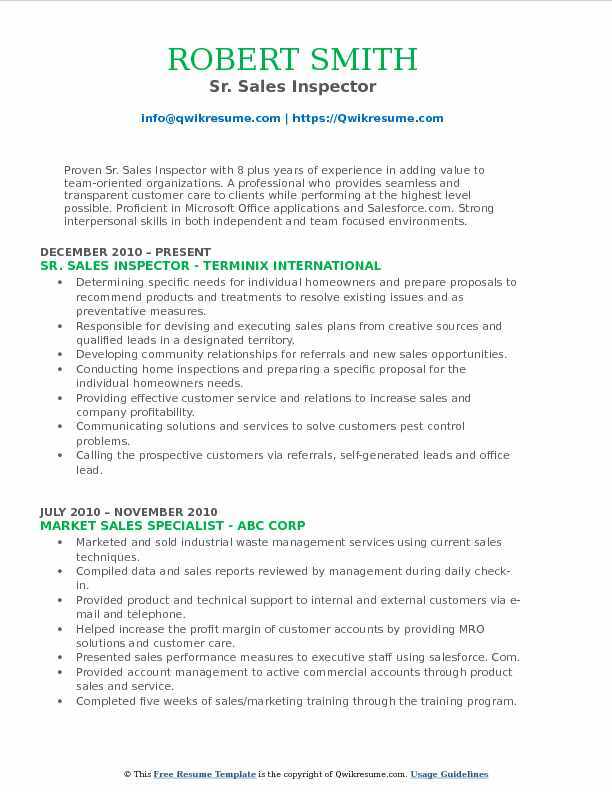 Summary : Sales Inspector with 8 plus years of experience in the Sales domain. My objective is to transfer my relationship-building skills in a number of different professional contexts to customer service, marketing, and business development. Skills : Account Management, Market Research & Analysis, Promotion and Sales Tactics, Foreign and Domestic Sales, Teambuilding, New Business Development, Customer Service, Cold Calling, Sales Consulting, Relationship Sales. Taking personal initiative and responsibility for correcting pest problems. Responding to, and initiating the telephone contact with potential customers. Developing the community relationships for referral and sales opportunities. Selling additional services to existing customer base and new referrals. Experienced in visually inspecting for pest, pest harborage, and pest entries. Creating leads with current customers, follow leads called into the national call center. Performing structural inspections in attics, basements, crawl spaces, etc for pest control issues, present services offered by Orkin to solve problems including attic restoration, crawl space moisture mitigation, structural drilling for termites, basic pest control and more. Managing the appointments at residential and commercial properties.